Wow, I just received my all new, re-designed 'Escape' jacket. The first jacket that was made for me was a fine jacket in it's own right, but not quite THE jacket. Working closely with me to iron out every single detail to get this jacket as screen accurate as possible, Magnoli and his people really came through. Every single feature on the jacket has been tweaked, re-worked and modified to be as accurate to the original screen worn 1930's California Sportswear jacket that Kurt made look so damn cool. 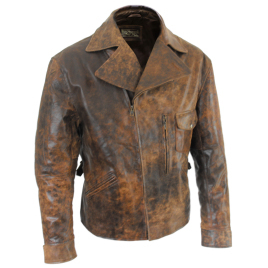 The new leather is as fine as fine can be and is a dead ringer for vintage horsehide. I can finally close the book on this one. This is THE definitive Snake Plissken jacket as worn by Kurt Russell in 1981's "Escape From New York" and 1995's "Escape From L.A."
Long live Snake and thanks again!